J Transl Med. 2011 Dec 20;9:218. doi: 10.1186/1479-5876-9-218. Ichim T, Riordan NH, Stroncek DF. In mid November the biopharma industry was shocked by the announcement from Geron that they were ending work on embryonic stem cell research and therapy. For more than 10 years the public image of all stem cell research has been equated with embryonic stem cells. Unfortunately, a fundamentally important medical and financial fact was being ignored: embryonic stem cell therapy is extremely immature. In parallel to efforts in embryonic stem cell research and development, scientists and physicians in the field of adult stem cells realized that the natural role of adult stem cells in the body is to promote healing and to act like endogenous “repair cells” and, as a result, numerous companies have entered the field of adult stem cell therapy with the goal of expanding numbers of adult stem cells for administration to patients with various conditions. In contrast to embryonic stem cells, which are extremely expensive and potentially dangerous, adult cell cells are inexpensive and have an excellent safety record when used in humans. 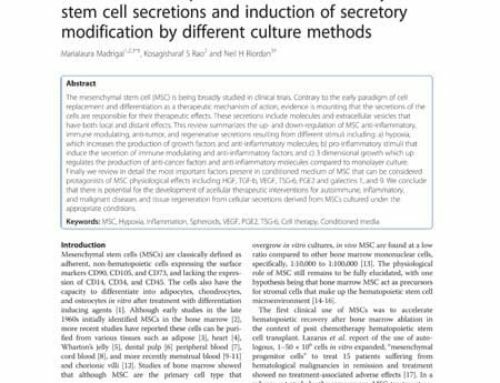 Many studies are now showing that adult stem cells are practical, patient-applicable, therapeutics that are very close to being available for incorporation into the practice of medicine. These events signal the entrance of the field of stem cells into a new era: an era where hype and misinformation no longer triumph over economic and medical realities.